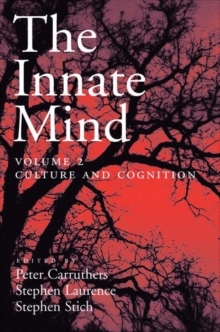 This is the second of a three volume series on innateness-one of the central topics currently debated in the cognitive and behavioral sciences. The series grows out of interdisciplinary "working groups" at Rutgers University. The first volume focused on the fundamental architecture of the human mind. The second volume focuses on culture. It is comprised of cutting-edge work by an interdisciplinary roster of well-known scholars including Robert Boyd, Peter Richerson,David Sloan Wilson, Paul Griffiths, Dan Sperber, Kim Sterelny, Scott Atran, and Peter Todd.